It should now be evident why unconsciousness rapidly occurs if breathing stops, or brain blood flow is interrupted even briefly. As the delivery of oxygen to the brain halts, neurons rapidly shift from aerobic to anaerobic energy metabolism, with a consequent drop in energy production, up to 95%! There will simply not be enough ATP energy to facilitate neuronal electrical activity and neurotransmitter discharge- the electrochemical basis for consciousness. And if aerobic metabolism ceases for too long, eventually either irreparable damage or even cell death may occur, as even the 'housekeeping-maintenance' neuronal activities fall behind or fail due to energy shortage. For most of us, falling unconscious or suffering brain death due to cessation of breathing or brain blood flow is not a regular problem to contend with! 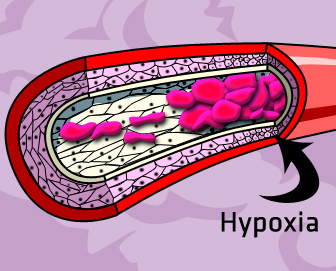 However, a more subtle, insidious, slow-developing form of brain energy crisis can and does occur in most people to some degree over a lifetime, in the form of cerebral arteriosclerosis, ministrokes, or transient ischaemic attacks (brief interruptions of brain blood supply, often due to blood vessel spasm). Slightly more difficulty in learning. At a more advanced stage the brain energy crisis may show itself as senility or senile dementia, and eventually may terminate in coma or death. Orthomolecular psychiatry pioneer Abram Hoffer has suggested that when the brain oxygenation becomes chronically deficient enough, neurons switch to anaerobic glycolysis as their main energy source. This may provide (barely) enough energy for the neurons to survive, but it will not provide enough energy to power their functional roles as electrochemical signal processors! transmitters. Then the affected neurons will be 'off-line,' in an electrically quiescent 'idling' state. 1. R. Branconnier (1983) "The efficacy of the cerebral metabolic enhancers in the treatment of senile dementia." Psychopharm Bull 19, 212-19. 2. A. Hoffer & M. Walker, Smart Nutrients, Garden City Park, N.Y.: Avery, 1994.